The Institute has been organizing a variety of short-term courses, workshops, seminars and training programs on various themes related to communication and media. We run regular short-term realistic programs for individuals from different echelons of the society. NSI Finishing School also conducts a large number of specialized short-term courses, ranging from one Month capsule courses to six Months intensive courses duration to meet the professional training needs of youth, educators, entrepreneurs, professionals and corporate and those who are educated unemployed seeking career opportunities. The specialized short-term courses are organized with a view to contribute better understanding of different issues pertaining to the booming Service Industry in the context of Global scenario. The main objective of such courses are to make individuals from different fields aware of emerging trends and techniques and sharpen their modular skills through international best practices. Photography: Our beginner Photography course will help you understand the basics of Photography so that you can work like professional photographers. In this we teach you the effects of light & how your eye fixes lighting. How to get your camera to catch what your eye sees to produce better pictures. The tutorials will also help you understand your camera and how to take pictures with it. Sound Editing: Every one of us listen music to relax ourselves. Most of us relate our mood to the music when we listen it on radio or TV. In this course the music & sound enthusiast learn to record, edit & produce a final mix down of the music by using Nuendo, Cubase, Sound Forge, Adobe Audition, etc. Video Editing: Video editing / Film Editing is part of the creative Post- production Process of filmmaking. Film editing as a team is derived from traditional way to working with films process but now digital technology & multimedia tools are getting popular in this area. Make-up Artist: We offer a variety of programs from 3 days to 8 weeks long. By this course we make students professionals in the beauty and entertainment sectors. We cover cosmetology, beauty therapy, nail art, make-up, hair care, skin care & personal grooming in this course. Hair Dresser: Learn the Basic tricks of the trade and be the best stylist. Maximize your potential as a hairstylist, with a solid foundation in basic styling. Learn the best classic cuts that are the foundation of any hairdressing career. Also learn various hair styles that we can use in our day to day life & also for parties . Stage Management: This course introduces students to the role and responsibilities of the Stage Manager. In this course we teach students the roles & responsibilities of stage manager, techniques used by stage manager during pre production, run & post production period , work ethics appropriate to task & situation. Cinematic Tourism Event Management: Cinematic Tourism describes the effects that Cinema can have on our travel decisions as they inspire people to experience the screened places firsthand. In this course we train students about the Cinematic tourism as an excellent vehicle for destination marketing, we also tell students about present & new product development opportunities, such as location tours, film museums, exhibitions and the theming of existing tourist attractions with a film connection. Film Tourism is the tourism that is generated as a result of the appearance of a destination or attraction in the cinema, video or television. Event Management: In this course we teach them the basics skills to plan & organise the biggest events – including fashion shows, awards nights, music concerts, corporate events, exhibitions and charity events. We provide students complete, in-depth training in all aspects of event management responsibilities. Anchoring/RJ/VJ: In this course we cover Pronunciation / Diction Clarity, Voice Modulation / Vocal Exercise, Phone-Line Interview, Camera Rehearsals, Introduction to Script Writing, Introduction to Studio Console & Music, Music Appreciation and Microphone Rehearsals. 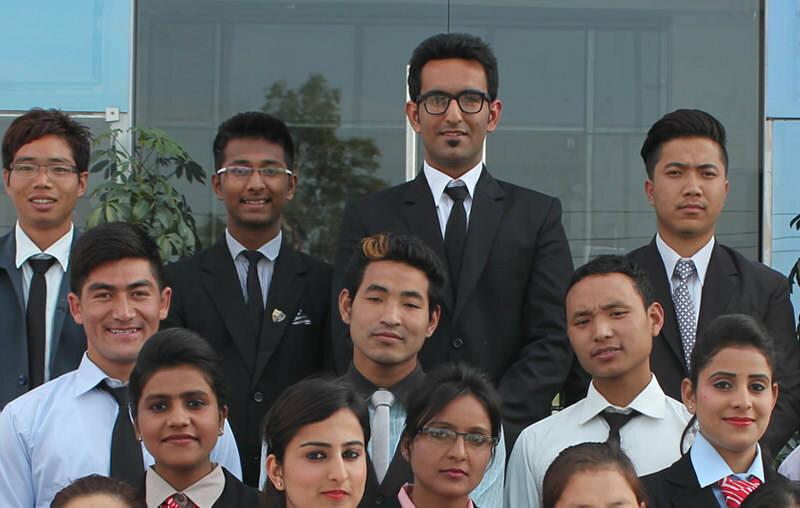 Airline Cabin Crew: Those who want to join Aviation Industry they can apply for this course. For girls there is Air Hostess course same way for boys who want to join Aviation industry they can join Airline Cabin Crew or Flight Steward Course. The main Responsibility if Flight steward or cabin crew is to ensure the comfort & safety of the passengers & to provide Hospitality services in the Airlines. Airline Customer Service Executive: An Airline Customer Service Executive is the first point of contact for a passenger in an airport or over the phone. They are the key person responsible for the happiness of Airline Customers. While some passengers are looking for assistance in checking luggage or printing a boarding pass, others have complaints and are looking for a quick resolution. Airline Ground Staff: Airline Ground Staff will prepare you to handle ground activities at Airports & Airline Companies. The requirement for efficient ground staff is increasing. The Air Traffic in India is expected to be 450 million by 2020. Moreover tons of cargo is transported by air daily. Our Course trains you to handle both people & cargo, and to work in various job roles in the areas of Airport Handling, Cargo and Transportation, Passenger Handling, and Customer Service. Personal Security: This course covers everything about personal security and self-defense. It also covers how to use simple techniques to complex situations in the street and how to use improvised tools & weapons for self-defense purposes, ultimately allowing you to protect yourself and others. Estate Security: The motto of Estate Security Services is that you and your family deserve true peace of mind when it comes to your Security. Estate Security measures to safeguard life and property in estate homes. We give students Selection, Construction, and Training in the use of safe room(s) located on the property. Industrial Security: The Industrial Security Program is a multi-disciplinary security program that focus on the Protection of classified information developed by Industries. The aim of this course is to identify emerging threats to Industrial Security and to devise protective strategies to meet the challenges effectively. Event Security: The aim of this course is to satisfy the safety and security training needs of those working in a broad spectrum of places of public assembly such as indoor and outdoor events including sporting, concerts and festivals. In this Course we cover Role of the Event Supervisor & Crowd Control, Mass Event Pre-preparation, Legislation and Practical Safety Considerations. Cyber Security: The Basic of Cybersecurity covers the fundamental concepts underlying the construction of secure systems, from the hardware to the software to the human-computer interface, with the use of cryptography to secure interactions. These concepts are augmented with hands-on exercises involving relevant tools and techniques & illustrated with examples drawn from modern practice. Pre-Departure including IELTS Training- Pre-departure orientation sessions are for the youth are aspiring to go abroad in which valuable information is exchanged during these sessions. Topics may include information on culture shock, IELTS coaching, Foreign Language (French), health and travel insurance, medical and money matters, plane ticket, and visas among others. Entrepreneurship Development Programs (EDPs): Entrepreneurship Development Programmes are being organized regularly to nurture the talent of youth by giving them knowledge on various aspects of industrial activity required for setting up MSEs. These Programmes are generally conducted in Polytechnics, ITIs , and other technical & Vocational institutions, where skill is available to motivate them towards self-employment. Management Development Programs (MDPs): MDP is a dynamic & wide training program that is designed to enhance and strengthen your leadership capabilities. This course ensure you have the skills, knowledge and resources to effectively lead, engage, and develop your team. The program consists of completing four modules focused on Core Competencies of people management, employee engagement and change management. Business Skill Development Programs (BSDPs): In this Course we focus on the various areas of business so that our youth can have full knowledge of how to start a business. Motivation and Training are the two crucial inputs for promoting entrepreneurship and sustaining the growth of existing small scale industries. Buddhist Pilgrimage Facilitation Executive Course has been systematically divided into ten modules to be covered in six months. These modules introduce the students to essence of Buddhist teaching with historical perspective of Buddhism, various sites of Buddhist pilgrimage, Buddhist way of living, their rituals and cultural belief. This course is well designed to train students in Buddhist religion, art and craft, belief, culture, heritage. Japanese Language will also be taught with Korean & Other Languages as Optional. Copyright ©1994-2019 ITFT Consultancy Private Limited. All rights reserved.